Welding within the Petrochemical Industry involves working in refineries and plants that produce gasoline and a variety of other petroleum-based products as well as chemicals and oil-related products. Welded joints in these applications are often critical and the insides of pipework must be purged with expensive argon gas to reduce the oxygen levels around the joint below 100 ppm. Due to the challenges of welding on-site in the Petrochemical Industry, Weld Purging Experts Huntingdon Fusion Techniques HFT® have designed a virtually non-destructible Weld Purge Monitor® for on-site conditions. 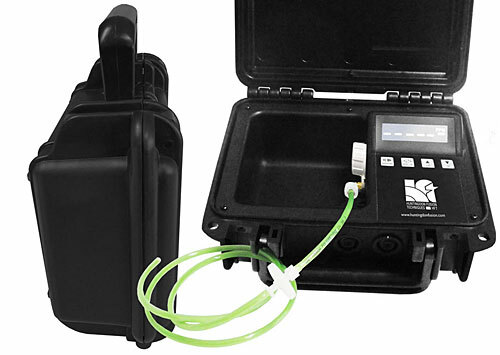 The PurgEye® Site is a guarded oxygen monitor in a secure, safe, waterproof and dustproof, very tough carry case. The large, bright, OLED display allows the data to be easily read and is mainly symbol based, rather than text. The display does not need a backlight and can be viewed from greater angles than LED screens. Oxygen levels can be indicated by the PurgEye® Site gas analyser in parts per million (ppm) or percentage, depending on user preference. Flow detection ensures accurate reading of gas samples, along with a blocked filter icon and power on / off with a standby button for sensor warm up. The small, low volume, almost indestructible case, can be carried anywhere and the PurgEye® Site used either with its internal battery, which lasts up to 10 hours or connected to mains electricity from 90 – 250 v, single phase A.C.
By using the PurgEye® Site, welders can ensure non-oxidised, zero colour welds are achieved regardless of conditions. Using a Weld Purge Monitor® also eliminates guesswork and saves considerable costs by preventing loss of argon.